@marco_b Your machine can not instantly achieve the set feed rate, it must accelerate and then decelerate to prevent lost steps. With dynamic laser power enabled the laser power will begin lower and increase as the feed rate ramps up, so you don't get darker edges. This is not recommended for non-TTL lasers as it puts more electrical strain on the MOSFET. @marco_b I use fairly aggressive default settings for acceleration so dark edges are rare but there's also no harm in enabling this option. 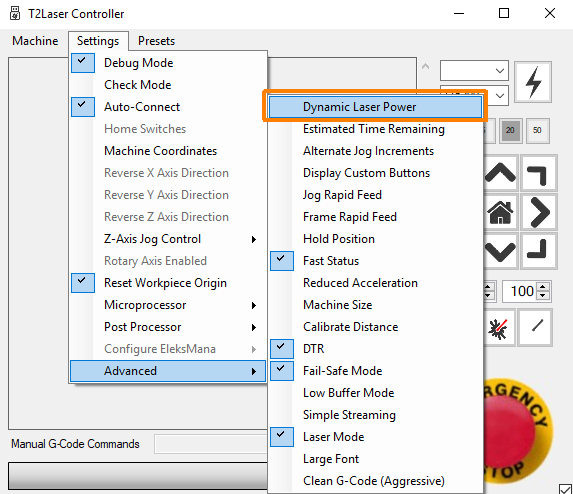 Where can I find the dynamic laser power button?